Blackpool is a borough, seaside town, and unitary authority area of Lancashire, in North West England. It is situated along England's northwest coast by the Irish Sea, between the Ribble and Wyre estuaries, 17.5 miles (28.2 km) northwest of Preston, 27 miles (43 km) north of Liverpool, 30 miles (48 km) northwest of Bolton and 40 miles (64 km) northwest of Manchester. It has an estimated population of 142,100, and a population density that makes it the fourth most densely populated borough of England and Wales outside Greater London. 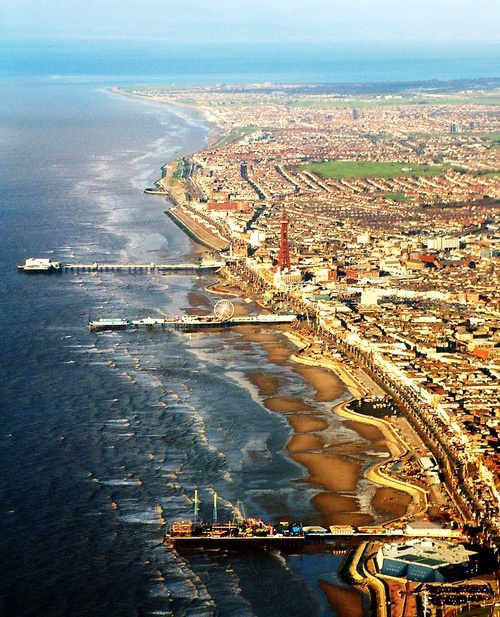 Throughout the Middle Ages and Early Modern period, Blackpool was a coastal hamlet in Lancashire's Hundred of Amounderness, and remained such until the mid-18th century when it became fashionable in England to travel to the coast during the summer to bathe in sea water to improve well-being. In 1781, visitors attracted to Blackpool's 7-mile (11 km) sandy beach were able to use a newly built private road, built by Thomas Clifton and Sir Henry Hoghton. Stagecoaches began running to Blackpool from Manchester in the same year, and from Halifax in 1782. In the early 19th century, Henry Banks and his son-in-law John Cocker erected new buildings in Blackpool such that its population grew from less than 500 in 1801 to over 2,500 in 1851. St John's Church in Blackpool was consecrated in 1821.